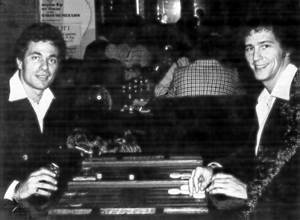 Gaby Horowitz and Bruce Roman Accompanying backgammon's meteoric rise in popularity during the past decade was the realization that backgammon is, at least in part, a game of skill. It is no longer a secret that the more informed player who consistently applies his knowledge at the table is likely to emerge victorious over his less informed opponent. This is particularly true in money games or tournament matches of long duration. Time, which tends to mitigate the vagaries of the dice, works in favor of the technically advantaged player. Realistically, however, most tournament matches are not sufficiently long to allow the skill factor to express itself in comparison to the capriciousness of the dice. The vast majority of money games, the planning of which can best be expressed in seconds rather than hours, do not continue long enough for a fair expression of skill disparity to occur. The weaker player must roll the right numbers at key points in the game in order to have a chance to defeat his superior opponent. The more skilled player can win with average or, less frequently, inferior numbers. The most common strategical error committed by the weaker player is trying to "hang in" the match as long as possible. This results in overly conservative checker movement and cube action and a complete unwillingness to "put the match on the line." This type of strategy increases the time factor of the match, which we already know works in favor of the more skilled player. In a strong vs. weak confrontation, the weaker player should exploit every opportunity to put the match on the line. This will often require taking risky and aggressive moves both with the checkers and the cube. If successful, however, he has succeeded in eliminating the time factor which is continuously working to his disadvantage. Additionally, the superior player with an intense dislike of big swing situations will feel the pressure and many times pass a technical take rather than risk a big swing. Quick, volatile, almost suicidal actions oriented towards the threat to end the match in one or a few games. It is axiomatic that unless you are a very skilled or very weak player you will probably be pitted against inferior and superior opponents in most tournaments; therefore, it is absolutely essential for you to be able to objectively assess your true abilities with respect to those of your opponent. It is not uncommon to observe both players in a match playing over-conservatively and offering the same explanation at the conclusion of the match, "He was so bad, I didn't want to give him a chance to . . . ."
Computer aficionados can often be heard talking about the "Garbage In, Garbage Out" factor (in relation to the validity of information obtained from a computer). This is no less true for the backgammon competitor. It is far more productive to admit, if only to yourself, that the opponent is more skilled than you, and to then employ the appropriate strategy for this particular adversary. The alternative is to refuse this admission and to proceed with the incorrect strategy, thus increasing your opponent's already favorable odds. The position illustrated in Diagram 1 occurred in the weekly Championship Tournament at the Cavendish West. Black, an intermediate player, was leading 6–4 in a match to 11. His opponent was a very skilled championship level player with an impressive string of tournament victories. Redouble White into a take, and if he wins the game advance to the Crawford game (10–4). Black realized that an 8–4 advantage is a substantial lead on paper, but not that difficult for a skilled veteran, such as White, to overcome. Thus, he chose to slightly "misplay" the 2-2 (Diagram 2) by denying himself two very valuable crossovers. White shook his head with a condescending smile. He quickly rolled a 6-5 and was then trailing by only six pips (Diagram 3). Black redoubled to 4, erasing the smile from his opponent's face. White, after a short hesitation, accepted the redouble, lost the game, and subsequently the match. Black did exactly what he should have done as the weaker player in Diagram 1. He created a more takable position in a nonskill confrontation in order to put the match on the line. As we have stated in previous articles and books, it is commendable to know the correct technical or mathematical move for any given position. However, one would be quite remiss in using data alone in determining one's final decision. Many times other parameters are more important. In Diagram 1, the relative skill levels and match score were of paramount importance, not the theoretically correct move. The position in Diagram 4 occurred in another tournament at the Cavendish West. Black, the substantially inferior player, was leading 9–8 in a match to 11. After a quick assessment of the position Black decided not to double, but to play on for the gammon. His decision was based mainly upon having one of White's men trapped behind a full prime. Although he has practically no bad numbers on his next roll, the probability of a gammon is minimal, because he has a substantial amount of work to do in order to effect a gammon. While it is certainly true that a gammon would secure the match, moving ahead 10–8 and to the Crawford game would give Black excellent chances for the ultimate victory. The majority of players, experienced veterans included, have a difficult time objectively assessing when to go for the gammon (as opposed to doubling the opponent into a pass or a take). The main factor to evaluate is the potential gain versus the potential loss in relation to the score. In positions in which the gammon possibility is high it is obviously correct to take the small necessary risks to attain it. This is especially true if, in obtaining the gammon, your score remains odd, you go to the Crawford game, or win the match. In positions such as Diagram 4, however, where effecting a gammon requires much work, fortuitous parlays and swings, one should be content with cashing in for the one point rather than to risk losing it (or more). It is a common foible to continue on for "imaginary" gammons. Black's prime, although sufficient to obtain one point by doubling, lacks sufficient spare men on the higher points to last for a long period of time. If he had spare men on the 8 and 9 point it would be a different situation. Also, should White feel adventurous and accept the double, Black would be in an enviable position. The match would be on the line versus a superior opponent in a position in which he has the best of it. Black rolled a 6-1 from the bar and White replied with 2-1 (Diagram 5). Make his bar point (Diagram 6) and hope that Black reenters on the 1 or 2 point and is then unable to escape. This move gives Black several bad rolls immediately and decreases White's chances of losing a double game — less blots. However, White's chances to win will also not be great without establishing the 4 point. Hit on his seven and slot the 4 point (Diagram 7). This greatly increases the gammon danger for one roll, but tremendously improves White's chances for an outright victory because it works towards building a permanent position of strength. If White was certain that his opponent would not double with either play, it is clear the play (b) is a free chance to turn the game around. Based on Black's previous decision to refrain from doubling and play on for the gammon, White could reasonably assume that he could make play (b) and not be offered the cube. Black has exactly a 50–50 chance of hitting one of the blots on 4 or 7. Having accomplished that, however, the gammon is by no means guaranteed. White will have several rolls in which to reenter and/or anchor. By losing the game without being gammoned, White is in no worse a position than if he had been doubled out of the game earlier. Thus, if Black fails to double to put the match on the line, White has a free aggressive play with minimal extra risk. In the actual match, White made the bold move (play (b), Diagram 7) and Black danced. White then rolled a miraculous 6-2, completing his prime, and Black replied with a 6-1. White played on for the gammon and moved ahead 10–9 in the match, and finally on to victory. In almost every match there is one or several key games or even plays upon which the entire outcome of the match rests. Do not push a desperate man against the wall, particularly if he happens to be a skilled player with abundant resources to turn the game around. Being aggressive when playing a superior opponent is definitely the desirable approach. You must, however, be careful to differentiate aggressiveness from pure greed. Black's downfall in the last game described stemmed from just such an inability.